This litter of puppies has been registered with the American Kennel Club and the American Field Stud Dog Book. Puppies are expected to go to their new homes in early September. 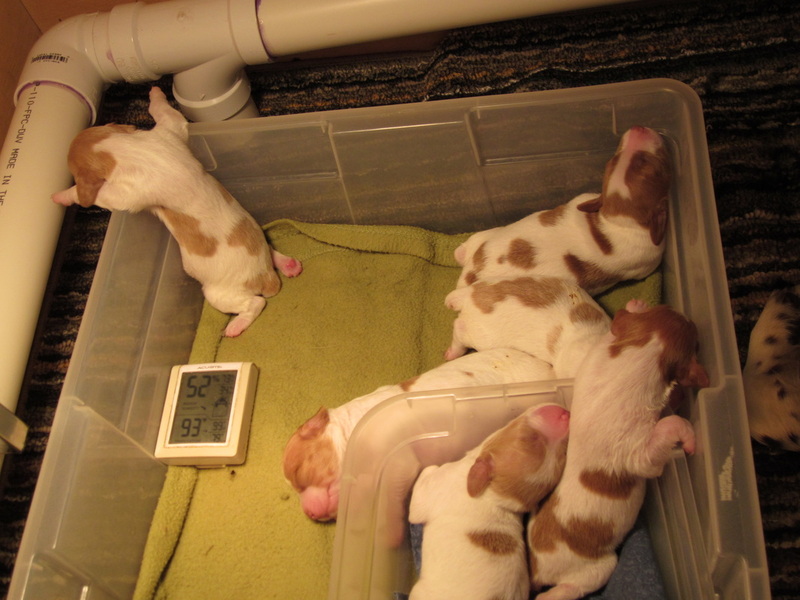 This litter has one white and orange male, one liver and white male, one liver and white female, two white and liver females, one orange and white female, and six white and orange females. The puppies and Taters were checked at the vet's office on July 17; all are healthy. The puppies are steadily gaining weight and growing. They are starting to respond more to their surroundings and mild stimulation. The puppies are content spending time away from Taters for short periods. All of the puppies are bonding with us and are used to being held. The puppies are moving around the whelping box and love crawling on one another. They rearrange themselves after meals or lonely when Taters is not in the box. ​The puppies are ready for visitors. Please call to schedule ahead of time at 715-680-6378 or 715-680-6379. If you would like us to contact you, please indicate either phone or email preference and time of day for your convenience.